SORRY NOW SOLD. MORE REQUIRED. 1 OWNER FROM NEW & ONLY 8,000 MILES. MASSIVE SPEC RS6 AVANT 4.0 V8 QUATTRO 560 PS finished in rare Sepang Blue Pearl Effect with Lunar Silver Valcona honeycomb leather, Rock Grey stitching & Piano Black inlays. 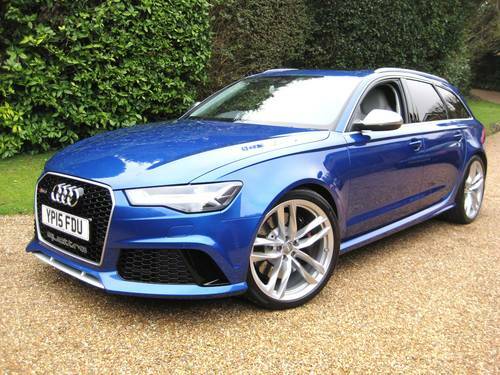 Specification includes Dynamic Pack, panoramic glass sunroof, sports exhaust system, optional 21″ twin-spoke design polished alloys, rear camera, Audi handsfree boot opening system, advanced Key with handsfree, Audi Connect, heated front & outer rear seats, MMI Navigation System Plus, Bluetooth interface, BOSE 14 speaker surround sound system, DAB Digital Radio, electric seats with driver memory settings, 4 zone air-con, cruise control, Audi parking system plus, Audi fitted carpet mats + Autoglym LifeShine paint protection etc. Supplied new & serviced by JCT600 Ltd – Sheffield Audi + remainder of Audi manufacturer’s warranty. Complete with full book pack + both remote keys. THIS IS AN ABSOLUTELY AMAZING LOOKING EXAMPLE FINISHED IN THE BEST COLOUR COMBINATION & STILL BRAND NEW.